This was sent to me by a dear online friend, but unfortunately I cannot read it. It opens in the voice of Aibileene, a black housekeeper, who speaks pidgin English, while her white employer does not even have a southern accent. Set in 1962, it is obvious this is going to become a civil rights story. While I will quite agree that this story needs to be told, just as holocaust stories need to be told, in order that we don't repeat the mistakes of the past, I cannot feel good about its trying to do so while spotlighting blacks in a derogatory way. I'm sure it was the author's intention that they display their superiority to some whites in attitude, but certainly it is unnecessary to, at the same time, display their ignorance, make caricatures of them. With whom am I to feel a connection here? It appears that the heroine of the story is one who sows seeds of dissent. I cannot help but feel some irony in that. 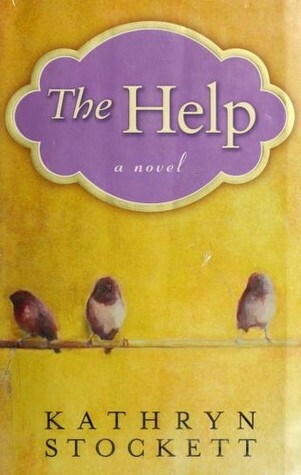 Sign into Goodreads to see if any of your friends have read The Help. Elizabeth, I certainly felt the same way at first, however as I continued with the author's story my opinion changed. It was a brave step to write in a black woman's voice and although the civil rights is an issue in the plot, the main story of three women in this point of history hovers above it. It's a women's story, regardless of race. PS. I do believe Toni Morrison has written in a white woman's voice without a sense of irony. While I'm a fan of Toni Morrison and haven't read this book, I'm a much bigger fan of the late, great not-to-be surpassed Mark Twain of Huckleberry Finn perfection, which I consider to be one of the top five greatest American novels ever written, closer to no. 1, actually. Can anybody do it better? Gosh, it's been years since I read old Mr. Twain. He was so entertaining. He sure was. Here I refer to his superb ear, his use of every dialect in the midwest and the south, to make Huck and Jim, et al. come alive, with wit, irony, pathos and extraordinary sensitivity. He's one of my heroes because of Huckleberry Finn - pure soul, pure decency, kindness, and great satire, as good as Moliere. Well, okay, he had a bad head for business! If you listen to the audiobook - -the white characters have VERY southern accents. Just curius why your one star rating and review of The Help was posted again in my vurrent update, since you first posted it in 2009. How far did you actually get in the book before you judged it unreadable? As I've said in the past, The Help was one of my Top 10 reads of 2009 and I learned SO much from reading that book and I highy recommended it to many people. Recently I finished a book called Walk Two Moons by Sharon Creech. One of the lines often repeated in the book was, "You can't know a man till you've walked two moons in his shoes." THAT is what I learned through reading The Help (and I would add to that, reading Cane River and Red River by Lalita Tademy). I felt like I'd been given a chance to walk for a bit in the life experience of someone else by putting myself in their shoes and feeling the characters; be they black housemaids, or white homeowners. There is no elevation or exploitation of one race over another in the end. It's finding freedom and purpose through our life circumstances and our trials that brng us to the place of overcoming them. I do highly recommend The Help and I look forward to listening to ir again in a year or so! Great book!!! I appreciate you expressing your honest opinion about this book. However, I absolutely loved it. When you say the white employers do not have a Southern accent, you're right in a certain sense. It's not the typical Southern accent you hear today. Keep in mind that these are white women that are affluent enough to afford help. Coupled with this being set in the 1960s, you should know that the accent is more transatlantic -think Blanche from Golden Girls. I believe your comment about the book spotlighting blacks in a negative way couldn't be farther from the point. This book shows a situation that was very REAL. If we can't cathartically write and read about these injustices they will always remain negative lenses in which we view certain parties or races in. You judged this book too soon and your comment shows how much you have to gain from a character like Aibileen that never went to formal schooling and speaks "pidgin" English. Why not tell the story with the derogatory views people had for them? I find it easier to step in someone's life in a realistic fiction book than a nonfiction book and I think Stockett thought that as well. She wanted people to connect better and she thought this would be easiest: to put African Americans on the spot just like they did in the sixties and before. To show what they had to endure. I think your comment about portraying blacks in a negative way is clearly misunderstood. While parts of the country had lots of changes to make, these woman who seem to have no power were actually very powerful in a behind the scenes kind of way. I just have to comment here. I am a white southern woman. In my head, my voice does not have a southern accent. If I were to write my thoughts, they would not be written in a southern drawl. However, if you hear me speak, you will know I am from the south. So, while the voice in my head has no accent, I hear the accents in the voices around me. My daughter's fiance is Irish and I hear his lilt each time he opens his mouth. My BIL is British and I have become accustomed to his very proper speech. If I were to write about either of them, I would probably attempt to try and convey their dialects since our culture is so much a part of who we are. I did not see Minny or Aibline in a derogatory or stereotypical way. Diction does not equal innate intelligence and both of these characters had that in great abundance. The criticism of the use of Black dialect as being disrespectful is more of a commentary on the lack of respect held for the southern accent in general - that truly intelligent women would have completely erased any vestiges of colloquialism from their speech. Having been born in 1958 Alabama, these voices sound very authentic to me. Rating a book you haven't read is bad form, unfair, and utterly useless to the Goodreads online community. I agree with Elizabeth it is not so brave to write a story of this nature after the civil rights movement has past. If the author had published it in the sixtys I might have more respect for her. It is too safe to write a story of this nature now. Where was she when she could have made a difference? I read it all but was not overly impressed with it for that reason. Blacks and Whites were not even legally allowed to marry until 1969! Well since she is in her 40s, she was not born yet. Kind of hard to write a book if you do not exist. How many books of fiction have been written about historical events, but from a "what if" perspective? Do you question the validity of the author's motives or right to speak from a fictional perspective in that time period? I don't understand the negativity with regards to the book's voice or message. Where's the error? I find it very interested that some people appear to be so threatened by that! Is the voice and message of The Help poking a few sacred cows in some way? Shining a light on something that people don't want to see in such a non-traditional way? Personally, I'm glad the book has had such acclaim and that the film and it's cast is doing so well too! I am anxiously awaiting Stockett's 2nd book whenever it is published. Debby wrote: "Good point Mary! How many books of fiction have been written about historical events, but from a "what if" perspective? Do you question the validity of the author's motives or right to speak fr..."
Interesting that you thought the black "voices" were derogatory. I did not feel that way at all. That is how they spoke. I grew up in VA my entire life and my grandmother was from Mobile, AL. They all spoke like this, black and white. It's very realistic. I think the reason the author did not have the white people speak that way is to highlight the perceived differences. If that's the only reason you chose not to read it, you have made a huge mistake. Also, I agree that you should at least try to read some of it before posting an opinion. The author was not condescending to the black people in the book. If you had read it you would realize this. Elizabeth, with all this response from your review of a book you wouldn't read, have you ever given the book another chance? Did you see the movie? It's so true that the "voices" in the book are so authentic to the class structure in the South and that comes across so well in the movie!